Mumbai, March 22: Former Australian batsman Dean Jones Friday claimed that Steve Smith's elbow is "lot worse" as compared to David Warner and hinted that it could play a part in team selection for the early matches of the Indian Premier League. "Look I have spoken (to both) Smith and Warner. Smith particularly, (his) elbow is a lot worse than Warner's. And that might play (a role) particularly in selection early (for the early matches)," said the 57-year-old Jones. Smith and Warner were handed year-long bans from state and international fixtures by Cricket Australia for their role in the infamous ball-tampering episode in South Africa in March last year. The ban did not include domestic or club cricket. Both were a part of the recent Bangladesh Premier League but were subsequently ruled out of the tournament due to elbow injuries. 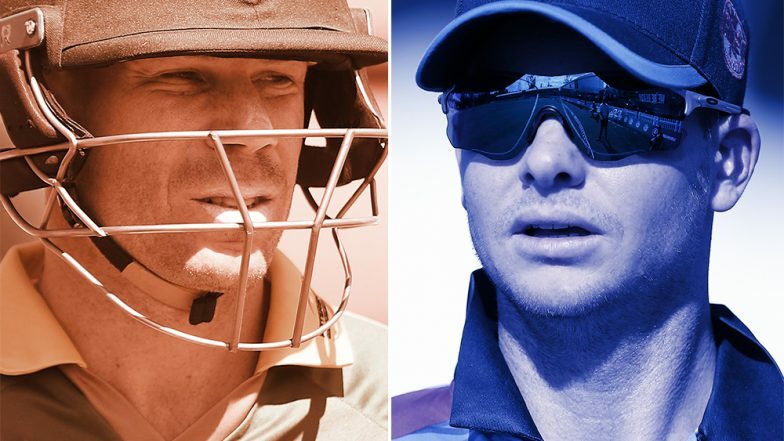 AUS vs PAK ODI Series 2019: Steve Smith, David Warner to Gel With Australian Squad Before IPL 2019. "Will they (Rajasthan Royals) play Smith in their best team, that's the big question. And you will have to watch the 'Dug-Out' to get the correct answer from me on that," Jones said at the launch of 'Star Sports Select Dugout 2.0'. While Smith will play for Rajasthan Royals, Warner will be seen in action for Sunrisers Hyderabad in the IPL. After Steve Smith, Now Injured David Warner to Return Home Midway from BPL 2019. "Warner is making some good hundreds (and playing) outstanding club cricket. Runs are runs. It will be interesting to see how he (Warner) fits in. There's a problem with Kane Williamson with his back, so how he fits in and will they (Sunrisers Hyderabad) give the captaincy to Warner again. We will have to wait and see on that," the former Australian batsman, who appeared in 52 matches and 164 ODIs, said.